The world’s leading corporate compliance software solution. CAS prepares an extensive list of paper and electronic forms for lodging with the Companies Office. BGL’s decades of experiance with compliance guarantees you will always comply with the Companies Act. Automatically prepares all the compliance documents you need. Automated document tracking with one click retrieval of documents. Manage all your corporate compliance tasks. Make one change across multiple companies with a click of a button. Ability to export forms documents to Adobe PDF, MS Word and MS Excel. Comprehensive training documentation and telephone technical support. CAS includes hundreds of standard management reports and listings. CAS includes BGL Corporate Tree - an easy to use graphical tool that automatically generates corporate trees from your CAS database in seconds. CAS also integrates with BGL Query, a sophisticated software solution that enables you to create user defined reports. CAS automatically creates and prefills forms and supporting documentation to ensure you comply with all requirements of the Companies Act. 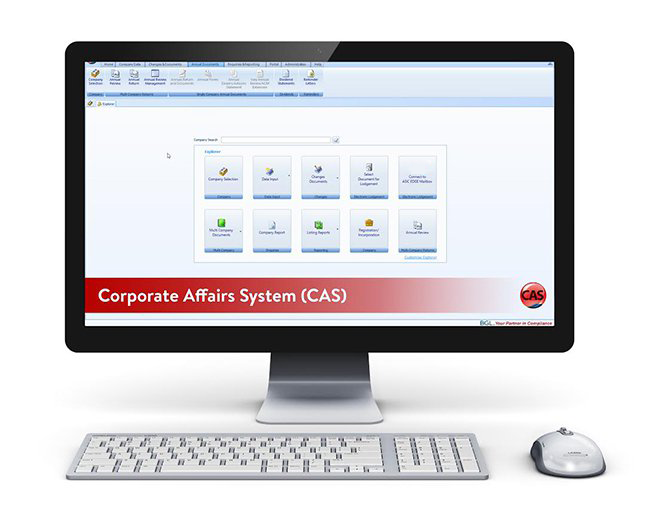 By making a simple change to a corporate register, CAS will automatically prepare all the documents required. CAS gives you the power and functionality to be able to prepare in excess of 400 Company compliance forms, business names forms and supporting documentation for 25 corporate jurisdictions including Australia, Fiji, Hong Kong, New Zealand, Singapore and the United Kingdom. Portal by BGL is a web platform that provides BGL clients with the ability to give web access to CAS data and documents. The data and documents can be accessed by your clients, auditors, financial advisers, company officers or any other interested person from anywhere and on any device (computer, smartphone, iPad etc). The paperless office is now a reality! Portal by BGL automatically tracks the movement of all documents from preparation and review to signing. Documents can be viewed, printed, signed, scanned and uploaded through Portal or can be digitally signed with BGL’s SmartSign technology. BGL SmartSign removes the need to print and sign documents. You can organise the data on Portal by BGL in the way that best suits your business, similar to a document management system. Portal is white labelled, meaning you can add your logo and design themes to make Portal look like your website. Portal can be fully integrated with your website and users can even access the Portal with a single sign on process from your website login. BGL Query gives you the ability to build queries and create reports from your CAS database. BGL Query allows you to filter and extract information with an easy to use, point and click, user interface. Simply select the data you require, the parameters to apply and with a single mouse click, BGL Query will create a data summary. BGL Query gives you the ability to create reports from your Simple Fund Desktop database on items such as Member’s Age, Member’s Mode, Member’s Details, Member’s Contributions, Investment Costs and Returns. For CAS, you are able to create reports on items such as Company Details, Company Member’s, Company Officeholder’s, Company Unitholder’s, Company Documents, Annual Returns, Director’s Interest, Share Usage, and CAS Company/People Mailing information. The reporting possibilities with BGL Query are endless, you can create virtually any query which will drag information in real time directly from your CAS or Simple Fund Desktop database. BGL Query includes a full featured report editor so you can change the design of standard reports to meet your exact needs. Company logos can be included and standard company fonts can be used so your reports look more professional and are consistent with your current company policies and procedures. Reports can be exported to CSV, XML or TXT, saved as PDF, Word or Excel documents. Contained within BGL Query, are a number of standard templates so you can start reporting immediately. You can add sub-fields to the existing templates so the data can be refined further, or you can create your own queries. BGL Query comes with an extensive user guide and is fully supported by BGL. The initial fee includes a one-hour web training session in which the trainer will show you how to create reports, modify existing reports and how to get the greatest benefit from your investment. Your subscription includes software, documentation, updates, and telephone support for a period of 12 months at a single site. Pricing for multiple sites is available from BGL. The subscription Renewal Fee is the amount payable in subsequent years to continue your product subscription. Prices are in New Zealand dollars. We pride ourselves on getting things right. That doesn’t mean we’re perfect, but when we make mistakes we fix them. If you’re not happy with your BGL product, get in touch with us within 30 days and we’ll give you your money back.